Stephan is a highly qualified Personal Trainer, who strives to continue to update his knowledge and abilities, to enable him to provide the best service to his clients. 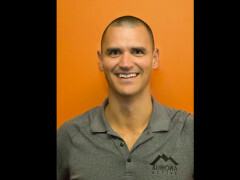 Stephan is very passionate about getting everyone more active, no matter your age, fitness level and/or injuries. Stephan has studied and works closely with many medical and health professionals to enable him to provide a gym that offers safe an effective rehab for clients. Stephan has trained celebrities, athletes, elderly and disabled with some fantastic results, helping people build thier strength, improve balance and stability: enabling people to overcome the physical demands of everyday life and feel healthier and fitter.